Congratulations to our students, who participated in this year’s BT Young Scientist and Technology Exhibition. 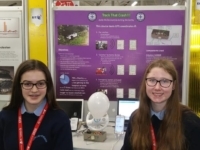 Four teams from the school reached this year’s competition finals and were among the 550 exhibitors who showcased their research at the RDS between the 9th and 12th of January. 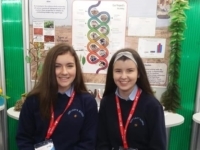 Our students’ projects included “Sphagnum: A Super Solution for Superbugs” in the Biological and Ecological Section, Senior Category which was presented by Isabelle Clarke and Kate Duffy. This project won a display award. “Track that Crash” in the Technology Section, Intermediate Group Category was presented by Aoife McDermott and Ashling McCarthy. 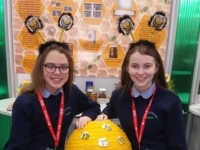 Hannah Duffy and Niamh Jordan competed in the Biological and Ecological Section, Junior Category with “Move Over Manuka – Irish Heather Honey Means Buzzness”. 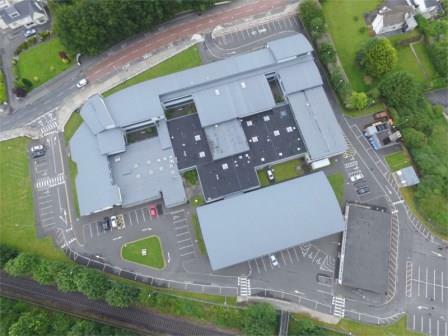 This project won a Display and Highly Commended Award. 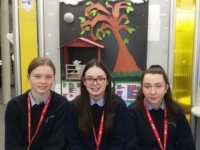 Eimear Galvin, Millie O’Brien and Hannah Lennon entered the Technology Section, Junior Category with”Lamb Watch” and won a Highly Commended Award. The members of all four teams have been excellent ambassadors for the school and showed great knowledge, eloquence and enthusiasm, while speaking with competition judges and the members of the public who visited their stands. In addition, the girls spoke with great confidence when they featured on RTÉ and Virgin One evening news bulletins and Radio One’s Countrywide. Hannah and Niamh even gave Brenda Donohue a run for her money during an interview for Today with Maura and Daithí. Thank you to the Science department and their teachers, who have guided them through the process over the past number of months. Thank you also to Mr Vinas, Mrs Benson, Mrs Maguire and Ms Greaney, who travelled with and were full of praise for the girls during their days away. The girls themselves, their families and friends should be very proud of their achievement.